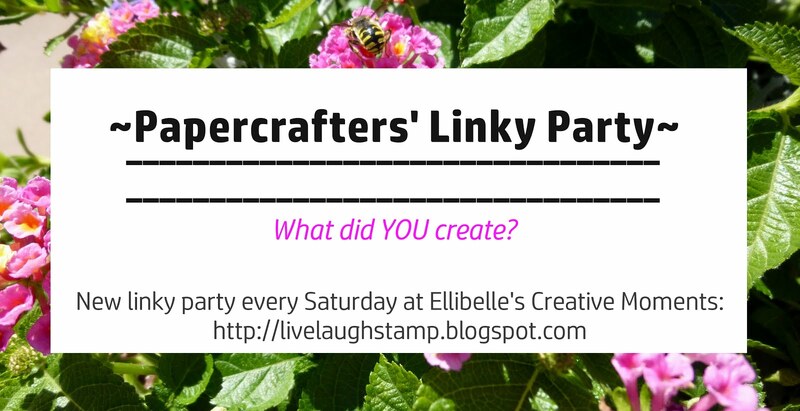 Click here if you are here for the Papercrafters' Linky Party. 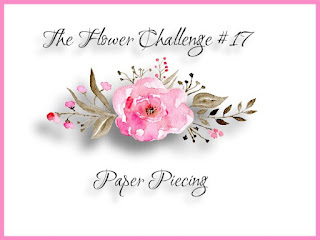 I wanted to join the Flower challenge this month where the theme is Paper Piecing and I used Karen's (Flower challenge DT member) idea to use a piece of inked card stock for my paper piecing. I had this piece (it was in form of a tag) laying in a box of scraps from when I was playing with my inks, and decided to use it for these flowers. You can see Karen's beautiful card here. To start I first masked off a 4 inch square piece of card stock and inked using Mustard Seed distress ink. After removing the mask I stamped the image using my Tonic Studios Stamp Platform . 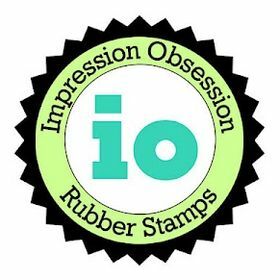 The stamp is by Penny Black Demure and was stamped using Versamark onyx ink. The blooms were stamped a second time on the inked tag then fussy cut. I don't remember anymore which colors of distress inks I used, but I did flick some water over the tag to activate the ink and create the blotchy look. A stamp from the Whimsy set Basic Backgrounds and Borders was used for the words on the yellow background. 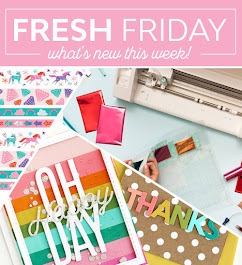 Sorry no link, Whimsy Stamps must have retired the set. 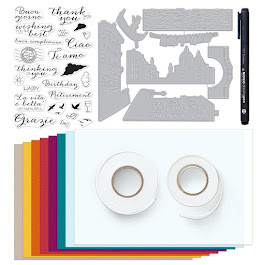 But this can be done with any cling or clear script type set, simply ink parts of the stamp and bend it for stamping to control where you want the words to be. To finish off the card I stamped a sentiment from the Penny Black set So Very Much added the word "with" from another little stamp. Framed and mounted onto Stampin Up card stock. It's a really lovely design with the flowers tumbling outside the central panel Ellie and pretty soft colours and agree it's a good way of using up left over inky paper and card. Eine wunderschöne Karte, tolle Farbkombination! This is sooooooooooo beautiful! LOVING the colors!!!!! What a wonderful and beautiful way to use that scrap piece of paper, I love the shades on it and it worked perfectly for your paper pieced flowers. Fabulous design, love the image, a really gorgeous creation Ellie. such a pretty card, ellie! 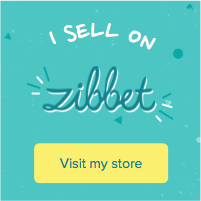 i love the text in the background. Love the modern feel to this card.